How do you find new blogs to read? I've recently carried out a spring clean of my bloglists. I like to do this every so often. My lists are arranged so that as a blogger makes a post their blog comes to the top of the list so I can be sure not to miss anything new. There comes a point though, when certain blogs lurk right down at the bottom never seeing the light of day. This generally means that the blog has become inactive, so every so often I delete blogs that haven't had new posts for over 6 months from my list and start to look out for new blogs to add. Using bloglists on other blogs is one of my routes to finding new blogs (so if you find an interesting new blog please don't keep it to yourself and add it to your list). This is one reason that I like to keep my list fairly up to date and arrange the list in the way that I do. It can be frustrating trawling through someone's bloglist only to find that 50% of the blogs listed haven't posted articles for an age. I also visit blogs of anyone who is new to commenting on my blog or if possible try to check out the blogs of new followers. Chances are that if someone finds my blog to be interesting then I am likely to find theirs of interest to me. Then there are of course blog directories. I've added my blog to quite a few as shown on this page not only does this let people know about my blog but in trawling the lists I can find other blogs that I can enjoy. Recently I had an invitation to join a Tribe on something called Atomic Reach. It sounds rather strange doesn't it? 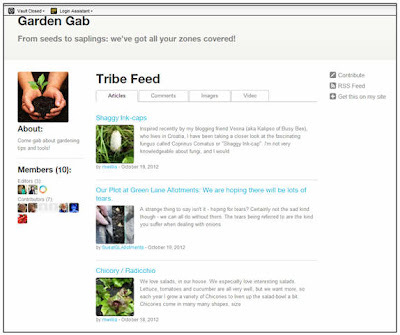 A Tribe is the name they give to an interest group and in my case the Tribe I was invited to join is called Garden Gab. The name is self explanatory. The idea is to submit blog posts for publication in the Tribe area. No extra work is involved - the idea being that this is another way of letting people know your blog is 'out there'. I'm hoping that it will also direct me to new blogs that I can follow too. 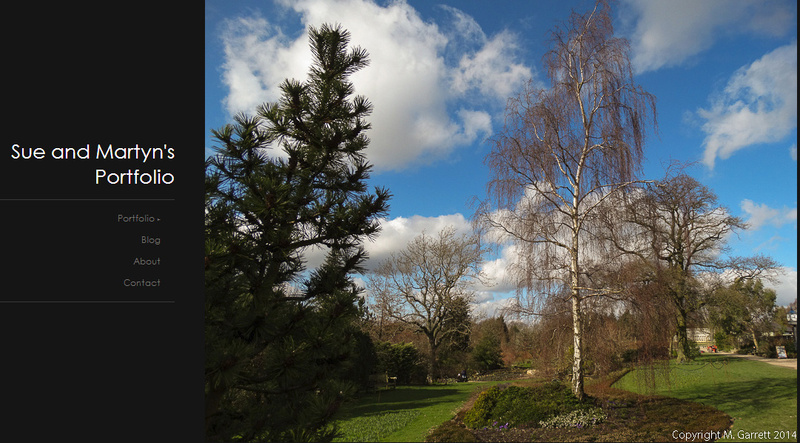 When I find an interesting new (to me at least) blog I tend to visit for a while before adding to my list as often new bloggers like new allotmenteers often don't stay the course. I know other bloggers use Facebook, Twitter and other types of groups to publicise their blogs but to be honest in spite of creating accounts I haven't really become an active participant of any of these 'social media' sites. They don't really fit into my lifestyle. 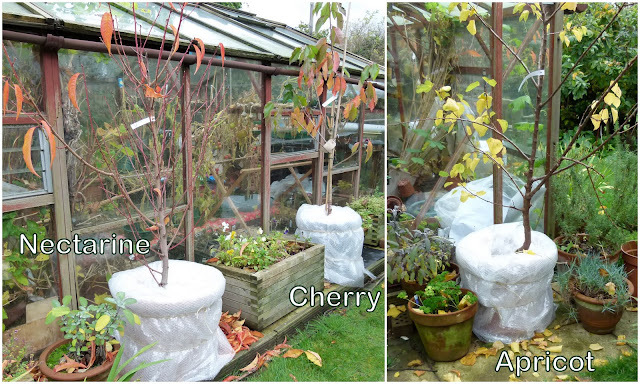 As regular readers know, we now have several fruit trees growing in tubs in the garden. 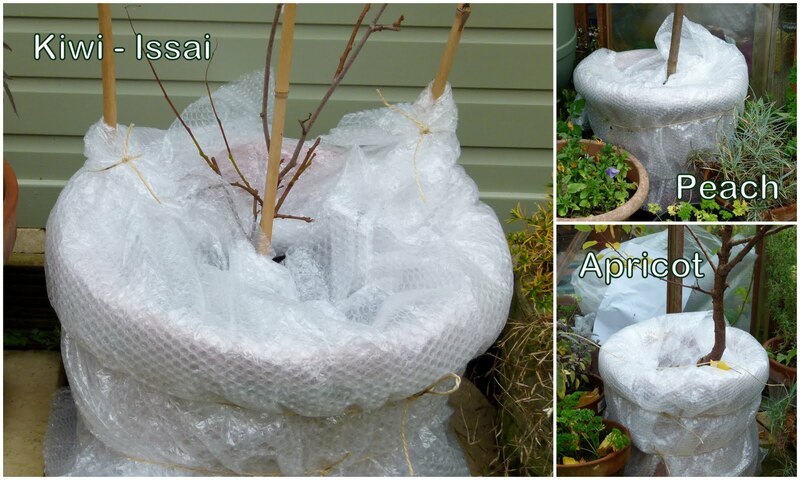 Being in tubs I am always concerned that the roots may be damaged if we have keen frosts over winter and so just to give a bit of extra protection during the worst of the winter I wrap the tubs up with bubblewrap. As colder weather is being forecast I thought that I had better get the winter protection in place and now the tubs have been supplied with their winter jackets. Each tub has been wrapped in four layers of wrapping which has been tied in position at the top and bottom. Excess wrapping has been tucked around the top of the pot. Last year we kept the kiwi - Issai in the cold greenhouse but this year we are trying it outdoors. Since buying the plant two years ago. we have been disappointed in that it has never managed to produce mature fruits. Each year things have looked very promising and then each year the plant has suddenly fallen victim to red spider mite. The infestation has been so bad that all the young fruitlets and even all the leaves have fallen. The plant then recovers and grows new leaves but sadly the chance of any fruit has gone. We are hoping that by keeping the plant outdoors over winter there may be less chance of the red spider mite taking a hold. We will also be on the look-out for the first signs of any spider mite symptoms and try to get on top of any potential attack. Apparently there are biological controls that can be used outdoors and we will have the Savona ready - so spider mites beware. ... and which we maybe should have removed then, had become brown and slimy. I scraped all this off before wrapping round the bubblewrap. 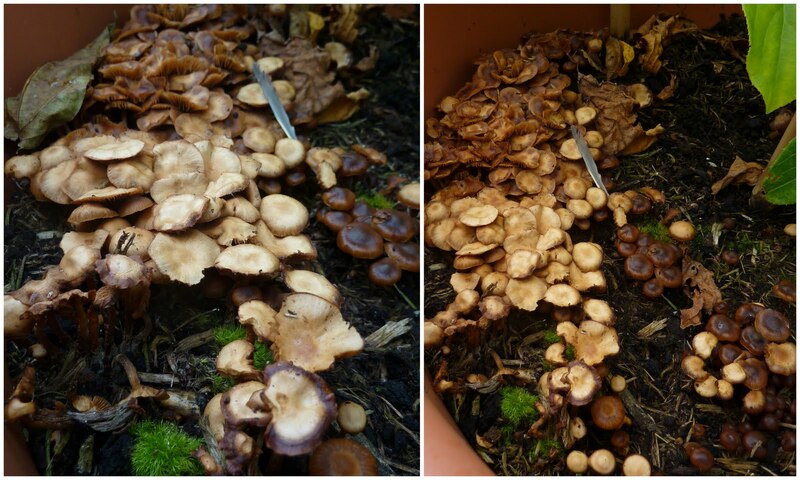 I know the extremely wet conditions has created just right conditions in which fungus thrives but I do wonder if something in the compost had encouraged the growth of this particular fungus as we haven't found it elsewhere in the garden or in any of the other pots. We planted two types of Michaelmas daisy in the front garden. 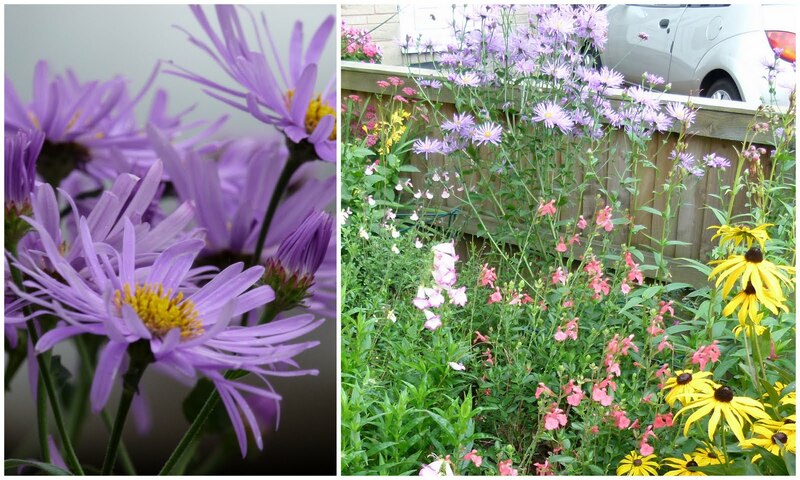 One of the varieties Aster × frikartii 'Mönch' has been flowering since August. 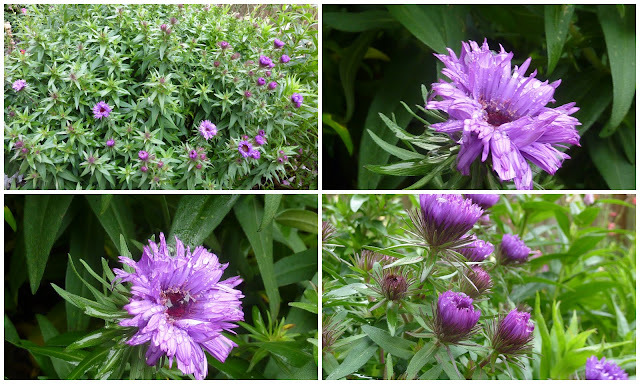 The other variety Aster novi-belgii 'Purple Dome' is really struggling to produce any flowers. It's not that it isn't a healthy looking plane, nor that it hasn't produced any flower buds. It's just that the flower buds don't want to open and who can blame them? The few flowers that have been brave enough to open have been drenched. The centre of this flower had it's own insect-sized swimming pool. We often get hedgehogs in our garden. We used to leave plant pot saucers full of water scattered around the garden so hedgehogs could have a drink after hopefully snacking on any slugs that they happened to come across. I'm sure anything that dines on slugs would need a long drink with which to wash it down. During a border renovation I had a thought - as I do - that maybe I could sink some sort of container into the ground and create a more permanent solution. Thoughts are dangerous things in our house and this thought developed and we ended up buying one of those prefabricated pond moulds - not a very large one, it only measures 80 centimetres by 50 centimetres, hence the name Puddle Pond. ... and then we set about trying to blend it into it's surroundings. We bought a couple of pre-planted baskets of pond plants. Unfortunately the plants weren't labelled but I do know that amongst them are a kaffir lily, maybe a couple of sorts of lobelia and a pontederia. As well as the planting baskets I also popped a large stone, that once was part of a rockery, into the puddle so that any birds that preferred low level bathing could have safe access. Grass was taken up to the edge of the Puddle Pond and then I set about planting around the edges so that it looked comfortable in its surroundings. Some of the plants used are shown below. As the pond plants have grown the Puddle Pond has almost disappeared and now is in need of a bit of TLC. To my shame I've really not taken much notice of this little pond - that is until this year. The kaffir lily has flowered profusely since August and is still going strong and the lobelia to has shouted out "Look at me!" 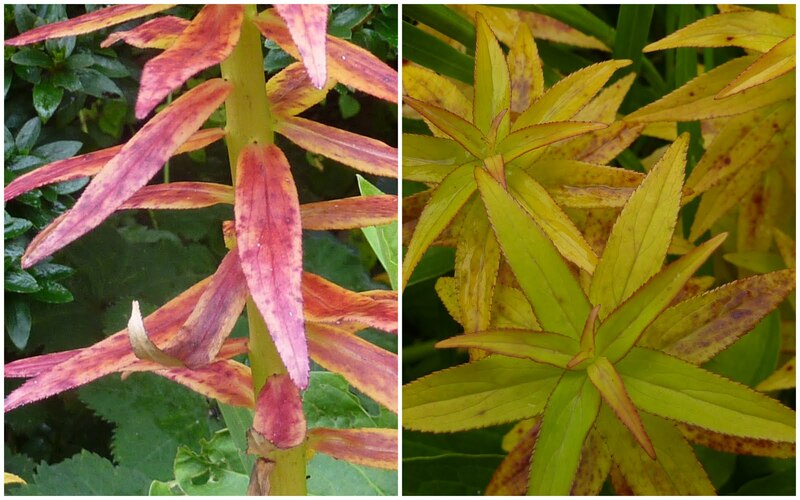 The plants have now put on such a show of lovely autumn colour. 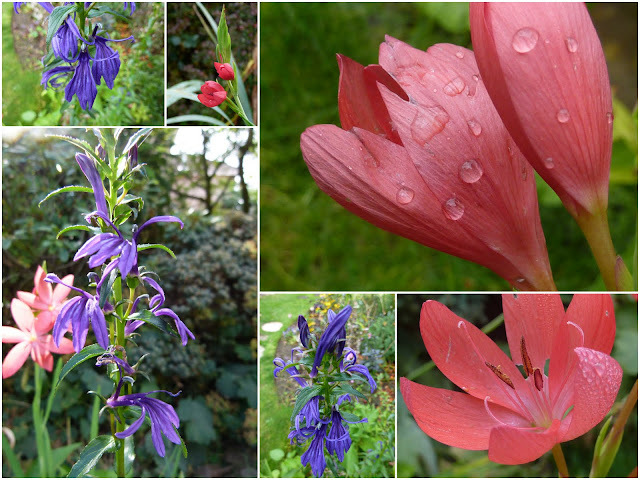 The kaffir lily is mingling with the beautiful autumn tints of the lobelia leaves. I must pay our little Puddle Pond more attention next year. 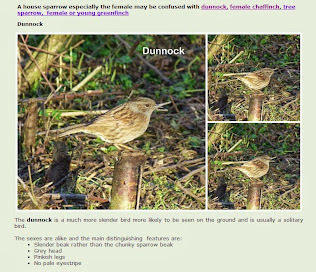 I've set up a page on my website about the Puddle Pond here which will follow its progress next year. It's like being back at school! Do you remember the feeling at school when you suddenly found out Mr., Mrs. or Miss. X had a first name that you shouldn't ever use in front of them? When I was teaching we had some teachers who became very cross if anyone used their first name in front of the children but to be honest it was something I never really bothered about. I remember one boy forgetting himself when I had done something that impressed him, (it maybe wasn't anything special but he was impressed). He suddenly jumped up from his seat punching the air saying "Super Sue strikes again!" Then he went bright red and covered his mouth with his hand in horror. I think he was relieved when I just found it funny and said, "Shall I pretend that I didn't hear that?" Well I must admit I get the same buzz when I find out the 'real' name of a blogger who before then had been only known as WeedyWelly (often not even knowing whether the person in question was male or female). Then I have the same dilemma as my pupils did in that I'm not sure what the reaction will be if I start referring to WeedyWelly as Wendy. Maybe WeedyWelly has a reason for preferring to remain incognito. Must admit I got a bit fed up of being GLAllotments. My original pen name was down to the fact that my blog was originally our allotments' site blog - then it became my personal blog and I was stuck with this totally unimaginative name. I didn't want to change it completely as by now it was a name I had become known by so I just added the Sue@ bit. I often wonder what I would have come up with if I had my choice again. If you join Google+ your choice for anonymity is taken away and your identity is exposed for all to see. I joined recently - really by accident but decided to try it out. What I hadn't realised even after reading the blurb was that when I comment on blogs etc. from that day forward I will no longer be known as Sue@GLAllotments. My cover has been blown! I suppose I could have given a false name - they wouldn't know or would they? There is of course one advantage to using a 'real' name. Recently a school friend who, after leaving university had emigrated to South Africa, tracked me down using the Internet. We lost touch more years ago than I care to mention. Letter writing can dwindle especially when you have to find enough to say to make the correspondence worthwhile. Then you have to remember to go out, find a post box to post it. Sending quick short emails when you have something to say is much easier and failing that you can use Skype so maybe this time we will stay in touch! I know some of you have very intriguing pen-names so how about sharing how you chose either your pen name or the name of your blog? Again my blog's name was just a slight alteration of the previous Green Lane Allotments. Boring isn't it? Then again how did you choose your profile image? 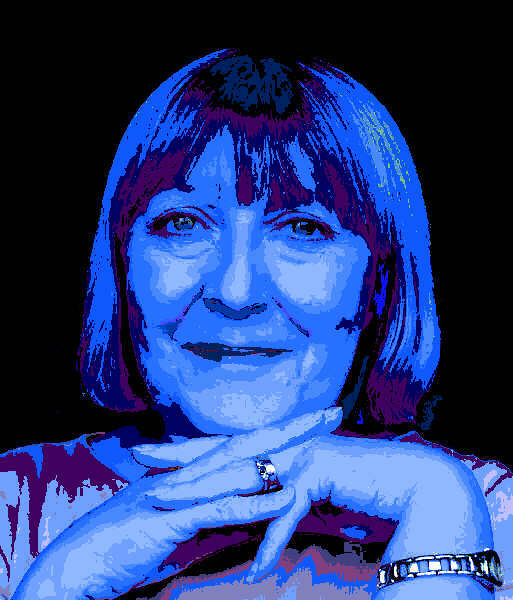 My Hockneyesque portrait just manages to bypass the fact that I don't like photographs of myself - the blue effect also hides the wrinkles (a little). I wonder what a psychologist would make of us all? Maybe it's best that we'll never know - that is unless one of you out there is a psychologist and feels like enlightening us! PS - As Mal pointed out I should have said the portrait was Warholesque not Hockney - Oops! As a thank you Mal I've included a link to you! In fact two. I wonder what it's like now? On 15 October during our last visit to the plot before we went on our break, I took a few photos. 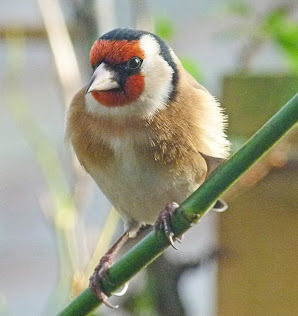 I took some photos in the garden too. 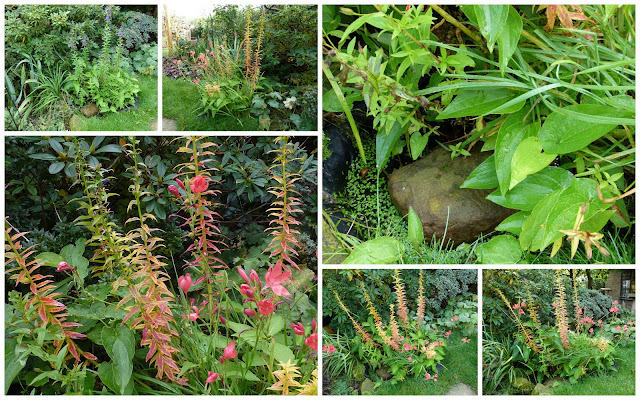 There was still colour in the front and back garden. Plenty of flowers still strutting their stuff as well as autumn leaf tints. On the plot too we still had floral displays. Despite having had a slight frost the dahlias had survived and so had the strawberry flowers. No tell-tale blackening of the centres indicating that the chance of any fruit had passed. I would have thought these two plants would have been the first to suffer frost damage but it was the courgette plants that were the most badly hit. Nasturtiums had also been knocked back. As well as planting the autumn onions as mentioned in a previous post we also harvested some mini onions, (although these were comparative giants in relation to some of the onions harvested earlier). These had grown from the sets left over after the onion beds had been planted. We squeezed the left over sets into a short row so the onions that resulted are only very small but may be very much needed this year. We dug some carrots - thank goodness this year we are enjoying a good harvest. Some of the carrots are huge but still have the small carrot flavour. The parsnips have healthy top growth but as yet we have not explored beneath the surface so have no idea how well they may have done. All the brassicas were also looking good. We picked what could well have been our last soft fruit and cucumber harvest. A cauliflower and the carrots would be travelling with us and were enjoyed at the holiday cottage in Stokesley. I'm hoping our next visit to the plot won't deliver any nasty surprises. In the album below I'm sharing a few more photos just in case you haven't seen enough! PS - Did you know that we gardeners are being held partially responsible for the poor potato harvest? Read Martyn's blog here to find out why! We've spent a few days away in North Yorkshire. Before we set off there was one plant that was causing me some concern. Would it survive a few days neglect? For several years now I have been trying to get an orchid to flower again. 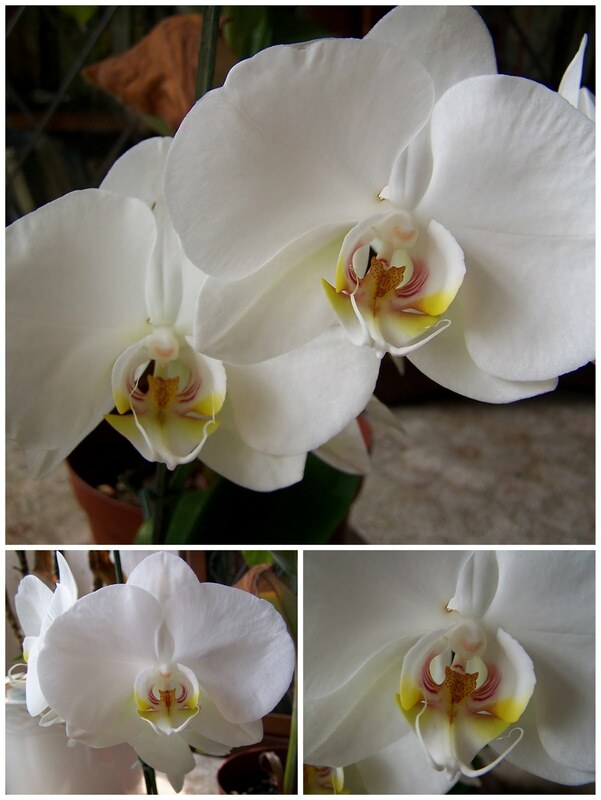 The story generally goes - buy beautiful orchid - orchid flowers for quite a long time - flowers die - leaves may drop off or at best stay green with no sign of another flower ... EVER. 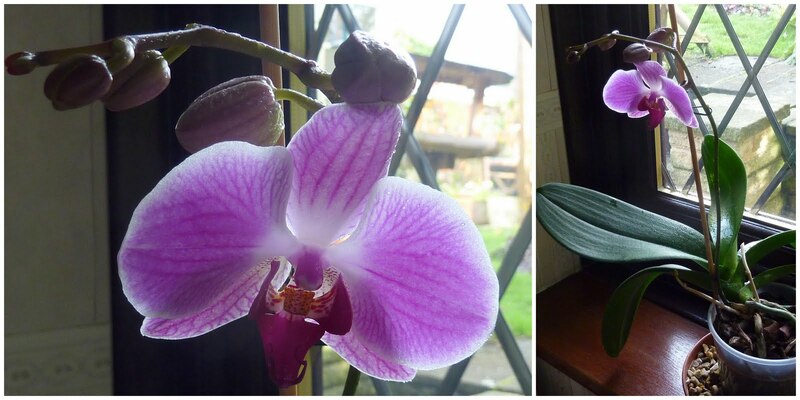 I have photos of the orchids that I have bought going back to 2004 but none have ever flowered again but I've kept trying with decreasing enthusiasm. Then this year I decided I would make a really concerted effort to try again. ... and another that my sister bought for me last Christmas. I've read all sorts of advice on how to get orchids to bloom again, some contradictory, so I decided to do my own thing by following my instincts and a few known facts. Both plants have been given the full treatment by which I mean they have been placed in an upstairs room in a East facing window (shaded by the magnolia tree in summer but very light in winter) and misted with a fine water spray daily. Other than that they have been given very little water. 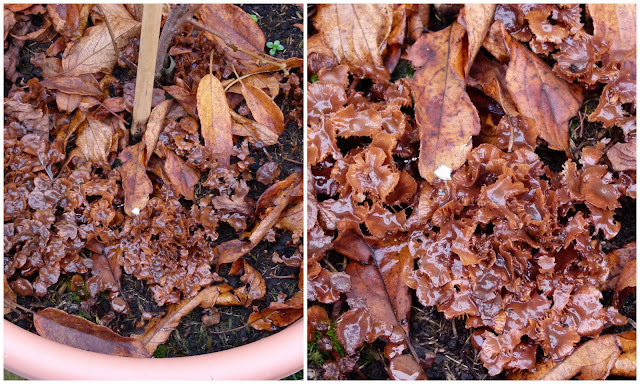 When I have watered them I have just held the pot under a running tap and let the water run through the bark compost. I've also avoided popping the clear plastic pot into a planter as I would normally do as apparently the roots need to be exposed to light as this helps the plant with photosynthesis (making food). If you have ever grown orchids, you will know that they keep sending out air roots that for a while trick you into thinking they are sending up a flower stem. The air roots need to be left to grow and are misted along with the leaves. I haven't tried tucking them into a pot or trying to hide them just let them do what they want to do. A few weeks ago I noticed that one of the orchids was sending up something that looked very different to the start of an air root and so I watched carefully full of anticipation. 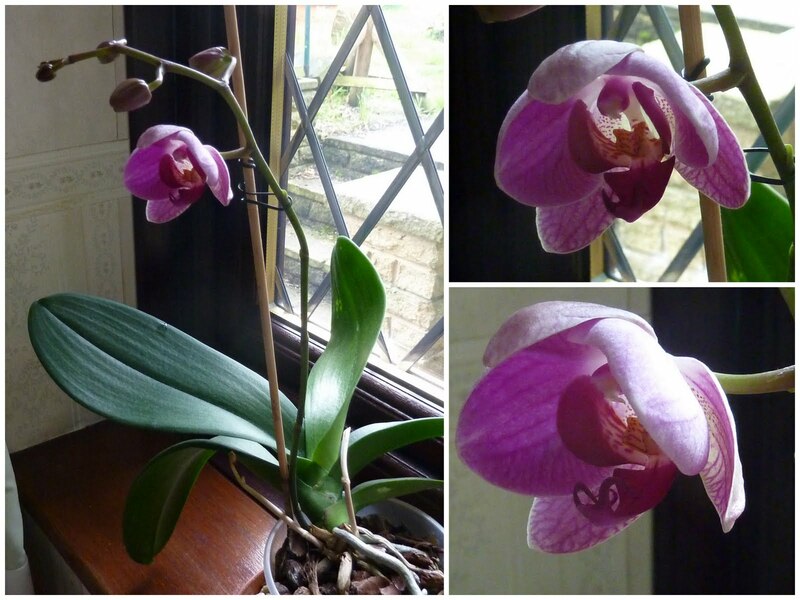 My reward was a developing flower stem which on 8 October looked like this. I anxiously watched as the buds began to swell. Would the buds just give up and drop off. Happily, no, they just kept on swelling until, as shown in the photos below, this was how the plant looked before we left for our short break. The buds were just beginning to unfurl (the photo quality isn't brilliant but, sorry I'm not risking taking it out into full daylight in order to take a better photo). On the 15 October just before we left I took the photo above. By this time I had brought the plant downstairs and sat it in a tray of pebbles. This was more to try and stop it tipping over than anything else. I also wet the pebbles to try and maintain a level of moisture whilst we were away. ... one flower is completely open and other buds are swelling. So I'm claiming that as a result! I don't know whether the plant has flowered again because of or in spite of my attentions but I don't really care. Now I just want to get the other plant into flower so I'm employing one of the best helpers a gardener can use - I'm crossing my fingers and hoping! Last week we spent a few days in North Yorkshire. Taking advantage of a sunny day we decided to explore the coast visiting amongst other places Staithes. After trekking, (well OK it wasn't really trekking, but the walk back up to the car park was very steep), up the hillside from the town we spotted this allotment. So why call this extreme allotmenting - for the answer view the short video clip. If any readers recognise it as their allotment plot then you have my respect! Aren't spiders fascinating creatures? Even if you hate them you must admit they are amazing. This photo isn't upside down. The spider - which I think was a zebra spider - was crawling on the underside of the table that we use for drinks on the plot. Zebra spiders are jumping spiders and stalk their prey rather than building a web and lying in wait. Sorry about the poor quality image but the spider refused to stay still and it was quite dark under the table. If you're not an arachnaphobe I have some garden spider photos and a video of one building its web on my website here. Whilst we're on the subject of stalkers. I seem to be getting a lot of annoying spam in my comments at the moment - most of which ends up in my spam but now some comments seem to be getting through. I wonder why these people don't realise that posting spam only aggravates people and doesn't make them likely to click on any links. I'm still resisting switching on comments moderation on all comments (and I don't want to have to go back to the dreadful word verification that many visitors hate) but I have switched on moderation for comment on posts over 5 days old so if you place a comment on an older post please bear with me - your comment (if you are not a spammer) will be published after I have read it. By the way has anyone any experience of using Disqus to replace the standard Blogger comments? We are hoping there will be lots of tears. A strange thing to say isn't it - hoping for tears? Certainly not the sad kind though - we can all do without them. The tears being referred to are the kind you suffer when dealing with onions. Wearing contact lenses seems to give me some protection but Martyn is often to be seen making a swift exit from the kitchen with eyes squeezed tightly shut and tears streaming down his face. Regular visitors may be aware that our summer onion crop was a very poor. I know many of you had similar experiences. Fortunately last year's autumn planted onions did well and we are still using them. At the weekend we planted this year's over-wintering onions. Again regular visitors will be aware of our experiments with weed control fabric. Onions can be a problem to keep weed free so we had decided to try using the fabric on the onion bed. The bed for the onions had earlier been cleared and gently tilled. As the soil was very wet we didn't want to work it too much. Fish, blood and bonemeal was applied and the fabric laid out in readiness for the onion sets to arrive. We decided to cut the fabric in a similar way to that used for the carrots so long cuts were made along the green lines of the fabric. The cuts didn't continue across the whole length as that would have made the fabric more flimsy so instead the cut lines formed sort of pockets. The fabric has been set into the soil down the edges and weighted down with long pieces of wood and old bricks. We bought three types of onion sets, Troy and Senshyu - yellow and Red Cross which believe it or not is a red onion. We have ended up with twice as many sets as last year so hopefully this will allow plenty of scope for losses if the experiment isn't a success. The sets were planted along the slits - probably slightly closer together this year as hopefully we don't have to allow for being able to weed along the rows. As well as keeping the weeds down the fabric should - being black - warm the soil a little. Hopefully as the onions grow the fabric will be pushed aside. The onion bed has been shared with garlic but I'll leave that until another post. Like any experiment it may end in tears of the wrong sort and either way you will be the first to hear about it! 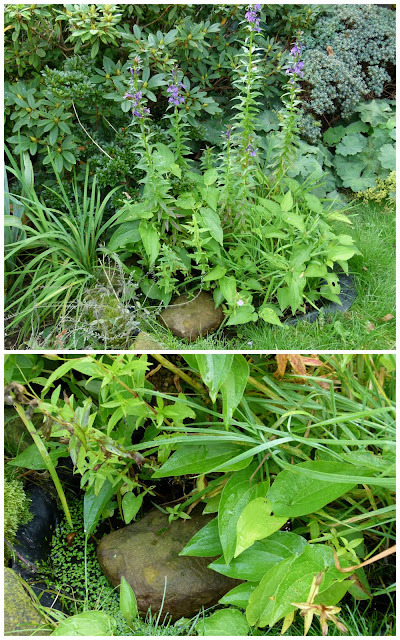 Back in January 2011 I posted about our garden plans for the year ahead which included sorting out how our pond filter discharged the filtered water back into the pond. At that stage it looked like this. Not a pretty sight. Plans changed and we decided to erect a summerhouse which meant moving the filter so this plan was put on hold. We needed to sort out the area for the summerhouse first so that we could decide where the filter would it into the scheme of things. We had a sort of brick 'trough' to one end of the pond that had housed a pond filter when we originally built the pond. Pond filters grew in size and so we had to rehouse the filter and over the years the 'trough' has gone through several incarnations, one being as a container for a very large gunnera (it would have been larger had it not had its roots contained). The photo on the left was taken back in 2005! As is the cyclical nature of things, pond filters have now shrunk again so we decided that we would reuse the 'trough' and relocate a new filter in the original position. So now the problem was how to hide the filter whilst still being able to gain access to clean it. 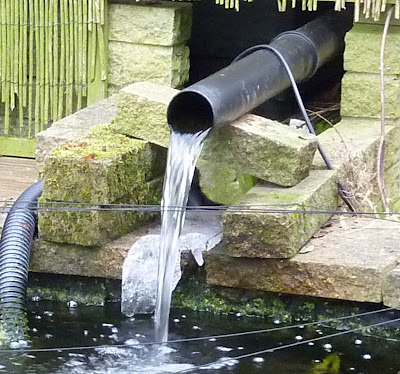 A light bulb moment - if you can have a living roof on a shed why not a living lid on a pond filter? One large lid would have been too heavy to lift on and off. Also it will mainly be the front part of the 'box' (notice it's now a 'box' and not a 'trough') that needs to be accessed for cleaning. The rear part houses the electrics. In the greenhouse we had some plastic trays which gave rise to light bulb moment time 2, Martyn created a frame into which three sturdy plastic trays could be slotted. 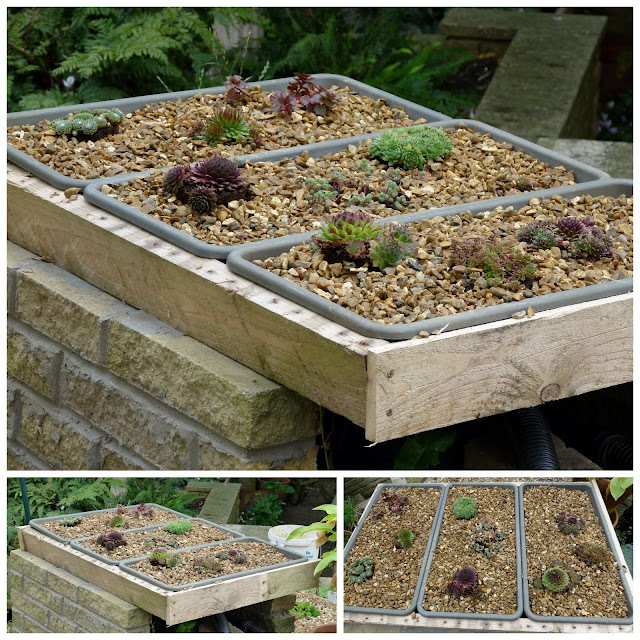 Some holes were drilled in the trays which have now been planted up with sempervivums and sedum. Space has been left for the plants to spread but if they seem reluctant to do this then I'll plant more. These have been dressed with the same gravel as we have used on the pebble garden. The wooden frame still needs staining - I'm planning on using the same colour as the summerhouse. Believe it after all this we still haven't solved the issue of how the water feeds back into the pond but we're working on it! We have a small quince which we planted on our plot in 2010. It's called Meeches prolific. 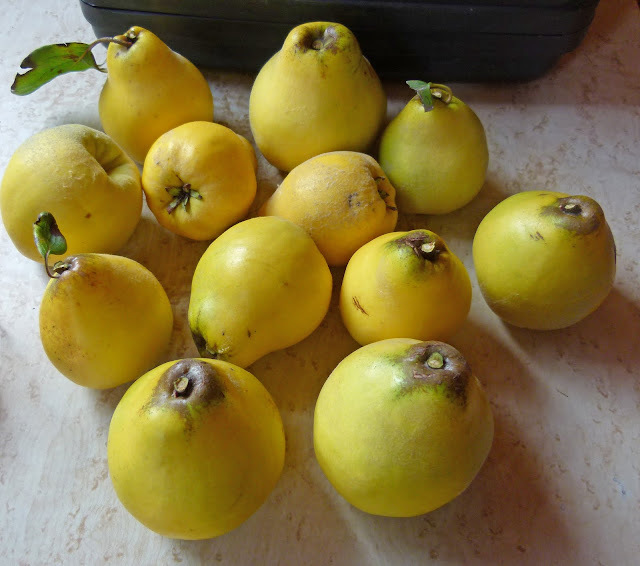 Last year was the first time we had tasted quince and we decided that we liked it very much. For a small tree we were quite pleased with the crop. This April we were delighted to see lots of blossom had formed on the tree. Two of the fruits were quite large - I'm not really sure how big a quince should grow! Unfortunately the two large fruits were split but they were fine when peeled. So this year our Meeches Prolific wasn't very prolific at all. 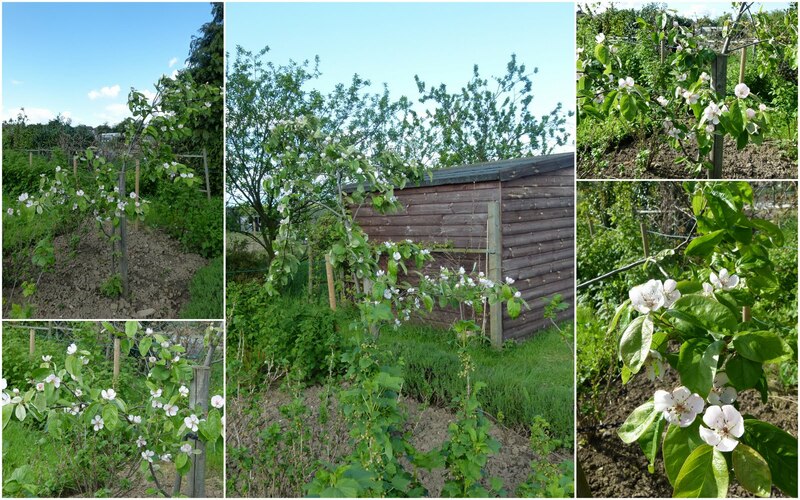 Still it did better than our plot pear trees which produced no fruit at all as all the baby fruits were shed. I'll forgive it this year and just hope for better things next season. We seem to be saying that a lot don't we. By the way our Victoria plum tree is very confused and has produced a second mini cropping - to read more visit Martyn's blog here. The new nectarine may not have given us any fruit this year but it has given us some striking autumn colour. The kiwi prefers more restrained yellow tints. Whereas the blueberry favours a vibrant red. Not in autumn dress but the sambucus nigra leaves are now turning darker. This is a cutting taken from a shrub on the plot. When they first begin to grow the plant has greener leaves which tun darker as the plant matures. I'm hoping that by keeping this plant in a container that we can restrain its growth and keep it to garden proportions. It's that time again when a visit to a garden centre makes you think you have entered a time warp! Everything is geared up to selling for that festival - the one that occurs at the end of December - in another two almost three months - no I will not mention the C word or the X word in this post! You'd think the clue was in the title Garden Centre wouldn't you? You could be forgiven for entering expecting to see all things garden related - instead you have to battle your way through lots of shiny, twinkly objects before finding what you have come for. Bulbs! Not the little coloured light variety but the sort that you plant in the garden. Oh for our newly closed 'proper' nursery. Anyway back to all things garden related. 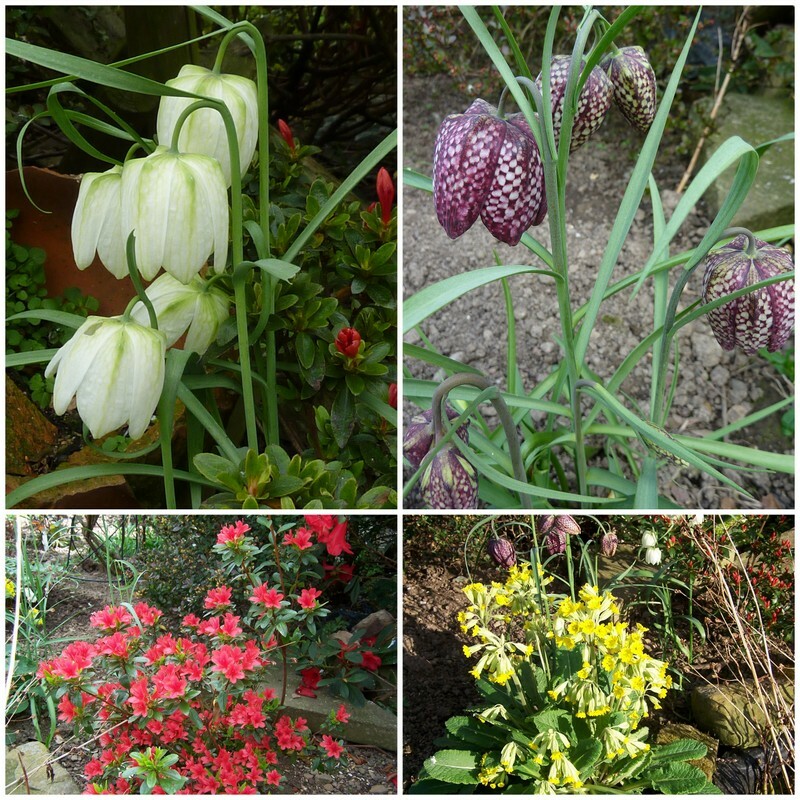 I had already bought some bulbs online - mainly for the blue and white border. You may remember that this is the theme that I chose for the border under the Malus Profusion crab apple tree. I must admit the border has been a bit disappointing. It looked good in spring and I planted lots of new perennials that should have given a good summer display but that never really happened. No doubt the weather had something to do with it - I just hope the plants are quietly surviving and will come into their own next year! Anyway I decided to add some spring bulbs to the border. Last year I couldn't find any miniature white daffodils locally or white lily tulips so I ordered these online. I chose narcissus- Silver Chimes and Thailia and tulip - Triumphator. I also ordered a collection of dwarf lilies and some Dutch Irises that were on offer. A collection of mixed tulips (destined for the plot as cut flowers) and some narcissus Minnow were free with my order. Anyway back to the grotto - oops sorry - garden centre visit. Guess what? This year there were lots of white daffodils so I chose another two varieties - Erlicheer (someone couldn't spell) and Tresamble. I could have ordered these online but I felt guilty about how much I was spending. For the blue element I bought some muscari - Dark Eyes, crocus - Blue Pearl and miniature iris - Alida. The free narcissus - Minnow, the Dutch iris collection and the newly bought narcissus - Dickcissel are destined for the front garden bed. Although a few Minnow have been planted in the pebble garden. They shouldn't grow more than 20cm tall so should be in proportion. If not I can always dig them up and move them. The blue and white bulbs have now been planted but the front garden bed poses a bit of a problem. I don't want to disturb bulbs that are already planted so I've planted the bulbs for this into pots so I can plant each clump when I know where the spaces are - I hope there are enough spaces or I'll be in trouble! Now I'm not venturing into another garden centre until January! It can't go on for much longer!